There are big additions coming to the Border-to-Border trail in 2019. Some of the sections to be built this year include: the Dexter-Huron to Zeeb project; a trail east and northwest of Chelsea; one tunnel under M-52 connecting the Waterloo and Pinckney Recreation Areas; and the B2B Trailhead adjacent to Lyndon Township Hall. Construction will continue on 5.3 to 8.4 new miles of trail segments. Construction began in February of a 1.2 mile stretch that connects to the Dexter-Huron Metropark east to Zeeb Road. It features two bridges spanning the Huron River and provides access to the park. Ann Arbor is also preparing to construct the $7.3-million Allen Creek Railroad Berm tunnel. 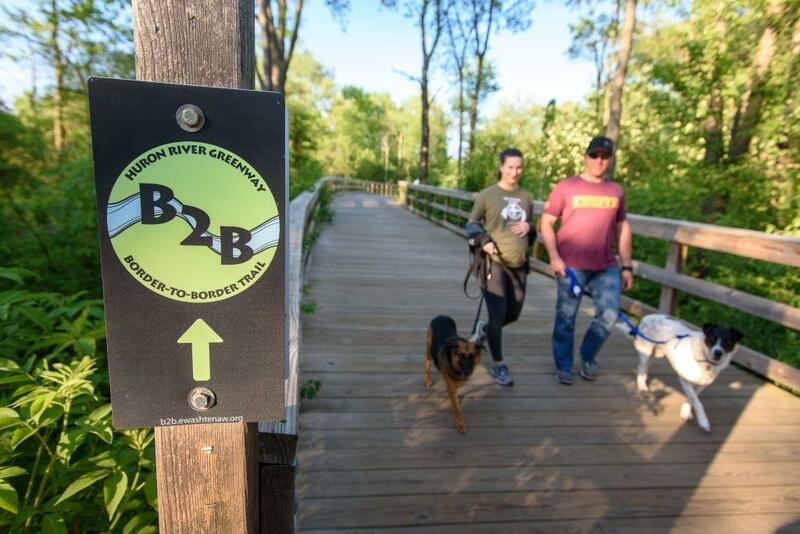 The pedestrian and stormwater tunnel will establish a safe pedestrian connection to the Arbor Cascades and Border to Border (B2B) Trail along the Huron River. Peter Sanderson, Senior Park Planner for Washtenaw County Parks and Rec, says the B2B is expected to be completed by 2022. Completion of the B2B is one of the Parks and Recreation Commission's top priorities. They have made a serious commitment to develop and expand access to multi-use, non-motorized trails throughout the county.